After a period of rapid growth, Phillips 66 Partners is shifting gears. That's one of three challenges it faces today. In the roughly five years since Phillips 66 Partners LP (NYSE:PSXP) has been publicly traded, its enterprise value has increased dramatically, going from around $2.5 billion to nearly $9.5 billion. But things are changing and the midstream partnership's future growth isn't likely to look like its past growth. Here are three challenges facing high-yielding Phillips 66 Partners as it looks to move into a new stage of its corporate life. Phillips 66 Partners was created by general partner Phillips 66 (NYSE:PSX), a refiner, so the general partner could monetize midstream assets while still retaining control of them. Phillips 66 Partners' first five years were driven by assets sales from Phillips 66 (also called dropdowns in the master limited partnership space). The results were nothing short of impressive, as the swift growth in enterprise value shows. Growth also showed up in the distribution, which has increased at a compound annual rate of more than 30% since the IPO! Distribution coverage, meanwhile, has been a solid 1.1 times or better the entire time. To be fair, the partnership's growth is coming off of a low base. However, at this point, Phillips 66 Partners yields a very enticing 5.3% and its historical distribution growth rate is pretty incredible. Except growth from here is going to look different. In 2018, growth is being driven by the ground-up construction of pipelines, including the Gray Oak Pipeline -- the largest project in the partnership's history. Building new assets entails far more risk than buying existing assets, though they usually have higher rates of return. Essentially, existing assets provide immediate cash flows from fully operational assets while construction involves execution risk and large up-front costs until the construction process is complete. This is the first major challenge facing Phillips 66 Partners: successfully moving to a far more complex and uncertain growth model. Parent Phillips 66, however, appears willing to drop down assets to help support growth if internal projects don't pan out as expected. It's a nice backstop that suggests Phillips 66 will remain a supportive parent during Phillips 66 Partners transition to a new stage of growth. There's no reason to believe that Phillips 66 Partners can't successfully drive growth internally. However, the timing of this transition couldn't have been worse. 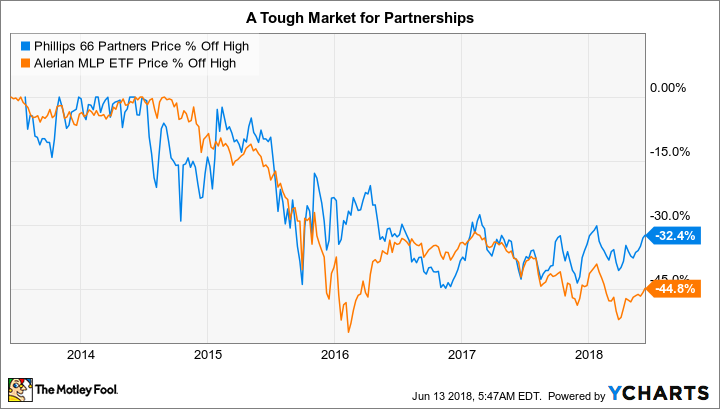 The entire midstream partnership space has been under pressure lately, pushing units of Phillips 66 Partners down by roughly 32% since their 2014 highs. In order to fund growth, Phillips 66 Partners, which distributes most of its cash flow to unitholders, needs to raise cash in the capital markets. With its units trading at a reduced level, selling new ones will be more dilutive than it has been in the past. This increases the partnership's cost of capital and reduces the benefit of expansion projects. There's two saving graces here. First, Phillips 66 Partners' debt-to-EBITDA ratio is a very low 3.1. For comparison, industry bellwether Enterprise Products Partners' debt to EBITDA is nearly 4.3 times, though Phillips 66 Partners' debt levels have risen just as quickly as its business has grown. Still, low leverage means Phillips 66 Partners has room to lean on its balance sheet to fund growth. But the cost of funding this model shift is something investors need to keep an eye on, particularly since building from the ground up involves a delay between costs and cash flows. The third headwind is more subtle: Phillips 66 Partners' swift growth is likely to slow down as its size increases, and its business transition suggests the future will involve longer spans between its investments and the returns on those investments. This is notable because the partnership had targeted 30% annualized distribution growth over the first five years of its life. That's a huge number, which it hit, and very alluring to both dividend growth investors and income investors, based on the partnership's high yield. Distribution growth has been impressive so far, but it may not be quite so generous from here. Image source: Phillips 66 Partners LP. But the future isn't likely to look like the past since growth is harder to achieve as a company gets larger, and building from the ground up involves more risks. Distribution growth won't slow down right away, since distribution coverage of 1.4 times in the first quarter provides ample room for distribution increases. But when asked specifically to provide a target distribution growth rate for the future during the first-quarter conference call, CFO Kevin Mitchell said the partnership wouldn't be doing that again. He suggested it would remain high for the sector, but clearly hinted that it wouldn't be as generous as in the past. Slowing distribution growth is appropriate as Phillips 66 Partners moves to a new stage of its corporate life. However, investors used to or expecting huge distribution hikes may not be pleased with the change. That's particularly true if they aren't aware of the business transition taking place today. It could even result in a continued unit price headwind if disappointed investors leave in search of greener pastures. None of this is to suggest the Phillips 66 Partners is a bad investment. It's simply in the middle of an important corporate transition that will likely mean a slower growth profile than it has had in the past. As long as you go in knowing this, and watching over the transition, this high-yield midstream partnership could be a nice addition to your income portfolio.